Adult wingspan is approximately 9–10 cm. Adult (butterfly) wings are orange with black veins. The hind and forewings have a double row of white spots within a thick black border. 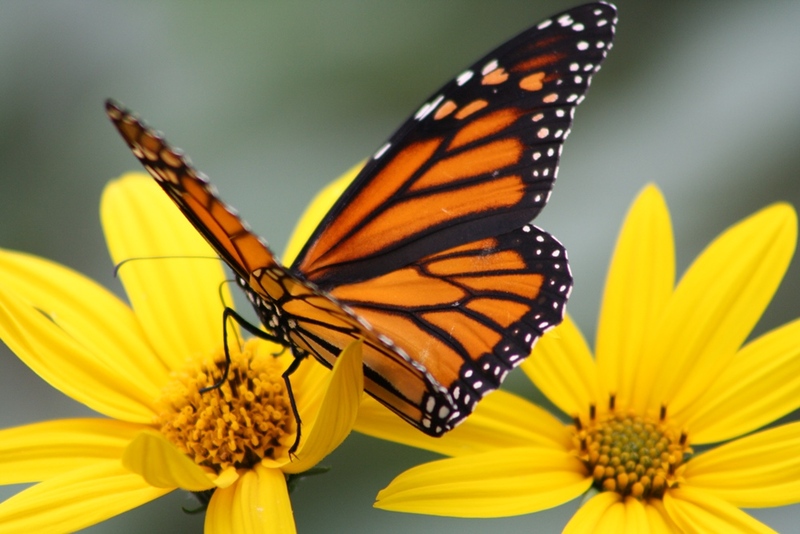 There are pale orange and white spots near the tip of the forewing (apex). The underside is similar, though the hind wing is a paler orange. Its black body also had white spots. Newly hatched caterpillars (larvae) are pale green with a dark head. 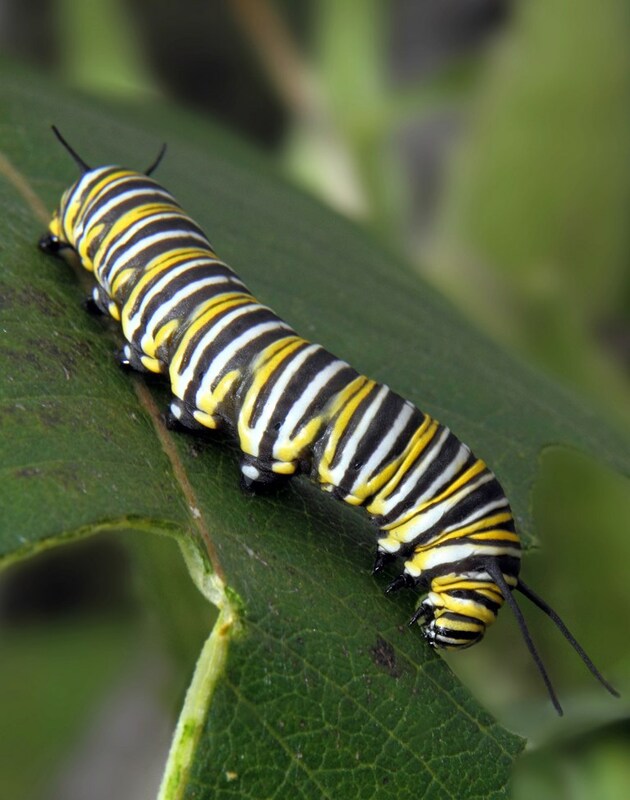 Mature caterpillars have black, white and yellow bands. They have a pair of black filaments (thin fleshy parts that resemble antennae) at the head and tail. The longer pair is at the head. 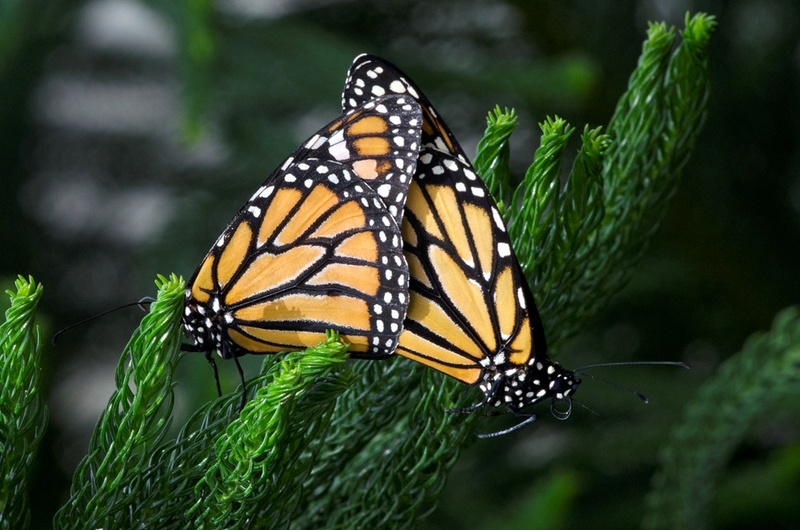 Similar Species: Viceroy (Limenitis archippus) is smaller and has a black line that curves across its hind wing. 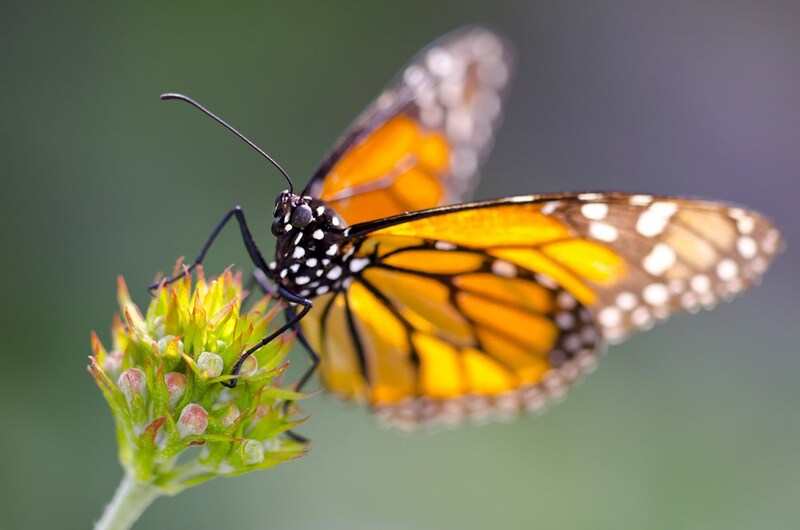 The viceroy is also known to flap its wings more quickly, alternating with gliding where its wings are held horizontally, whereas monarchs hold their wings up when gliding. Range: Across Canada from British Columbia to Newfoundland. Habitat: Open woodlands, fields and meadows, marshes, roadsides, gardens. 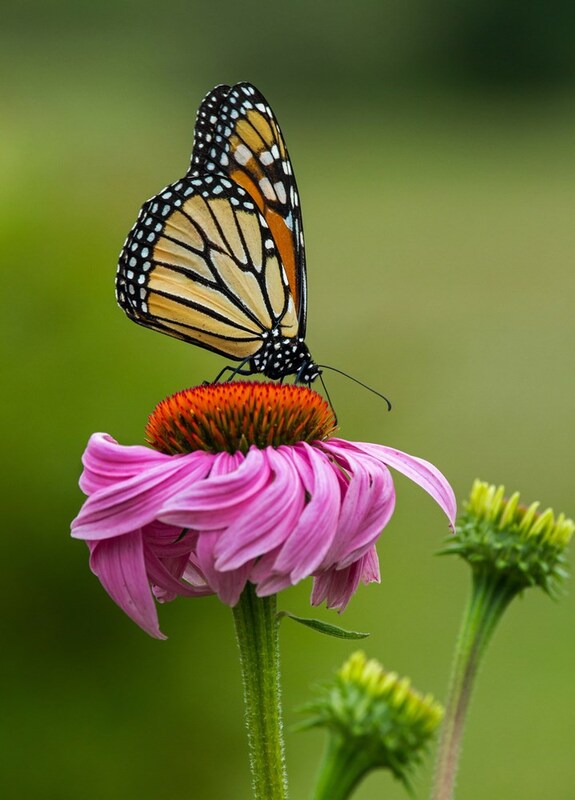 Diet: Adults (butterflies) eat flower nectar from a variety of plants with open or deep flowers. 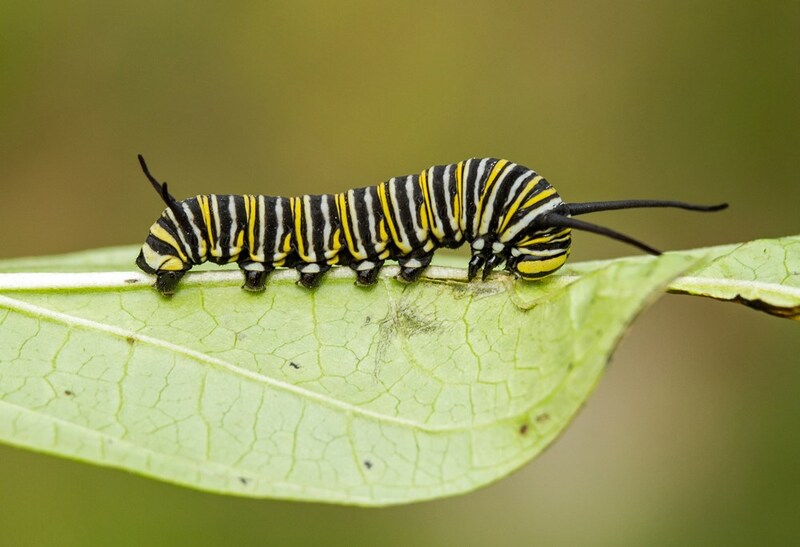 Young (larvae/caterpillars) feed on any of Canada’s 14 native milkweeds, especially common milkweed (Asclepia syriaca). Milkweed toxins (cardiac glycosides) make them distasteful to birds, with the exception of a few species at the overwintering sites in Mexico. This poison is stored and passed on to their adult form. 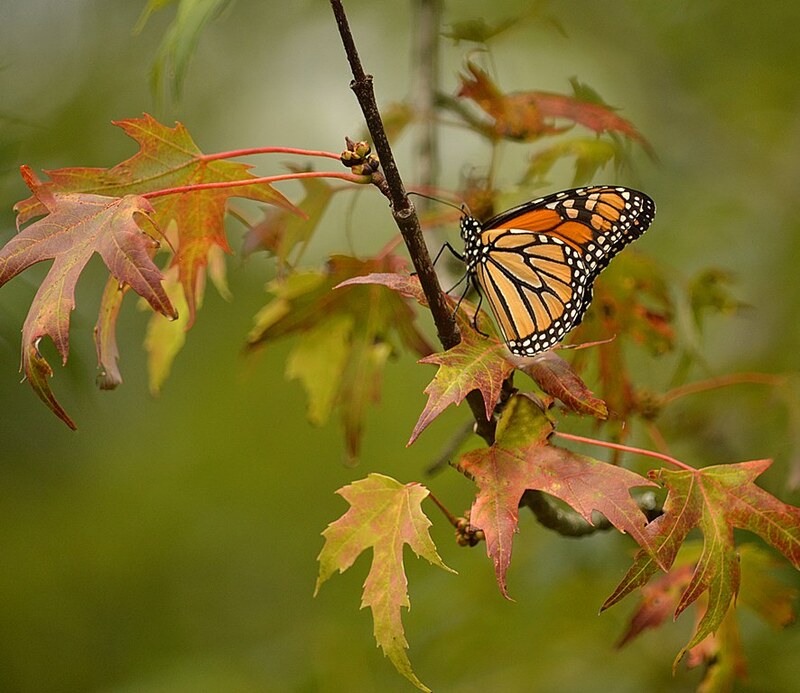 The monarch is famous for its spectacular migration to overwintering sites in Mexico and California, a trip of up to 4,000 km. 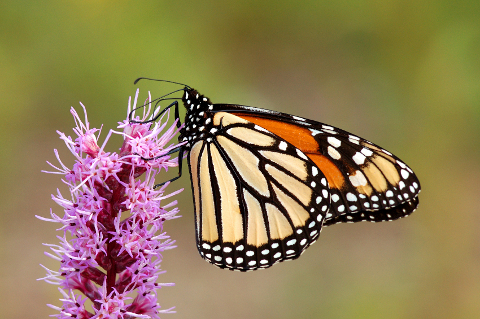 Monarchs begin to move south anywhere from the end of August to October. 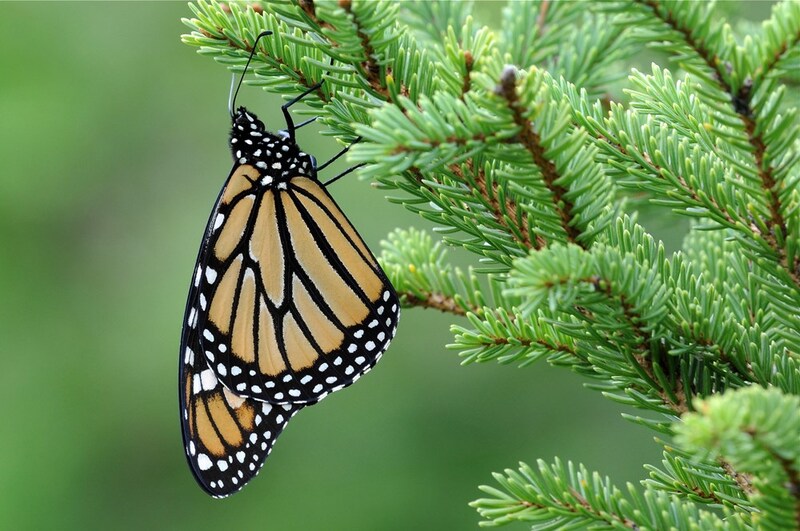 Monarchs from western Canada migrate to California, where they live in groves of pine, cypress and eucalyptus trees. Those east of the Rockies migrate to oyamel fir forests in the cool, moist mountaintops of a few small areas in Mexico. Over the winter months, they typically stay on tree branches, living off the fat they stored in the autumn. By the end of winter and early spring, they begin to feed, mate and start their journey north, breeding as they go. Some make it back to Canada by late May but these are the rare few that survive to complete the round trip. The others are those that develop from eggs laid along journey, taking a few days to hatch, eat and get bigger over the following two weeks. They then create their chrysalis (cocoon), which they emerge from after another two weeks. These new generations also breed as they move northward and typically arrive in Canada in June and July. 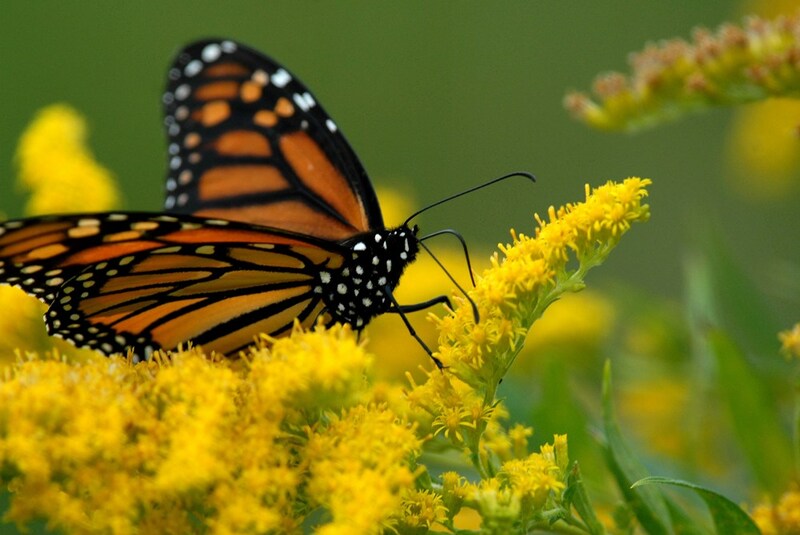 Populations are in decline due to loss or degradation of habitat from housing and commercial development, spread of invasive species, pesticide use, the removal of food for both adults (nectar sources) and larvae (milkweed) in large agricultural areas of the Midwestern United States, and the destruction of overwintering sites. 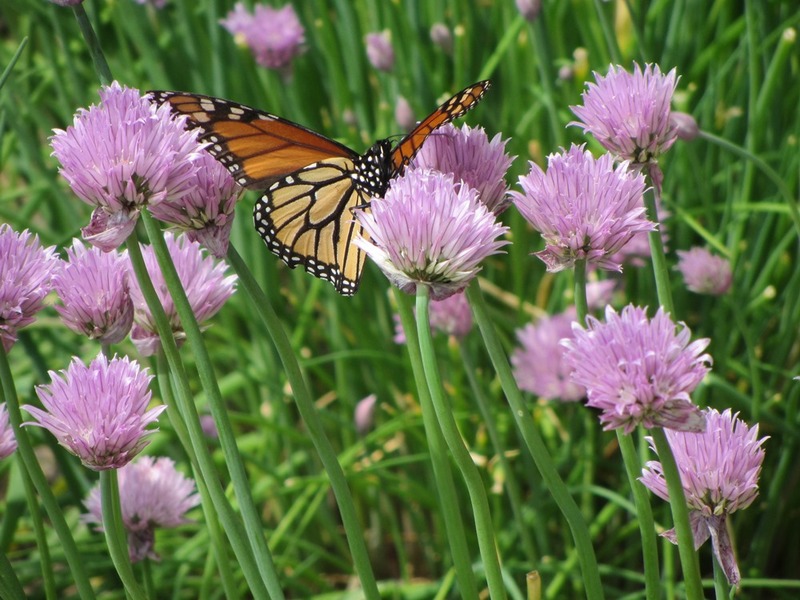 Many landscaping habits that promote gardens dominated by lawns with minimal shrubs and perennials make it harder for monarchs to find food and larval host plants. 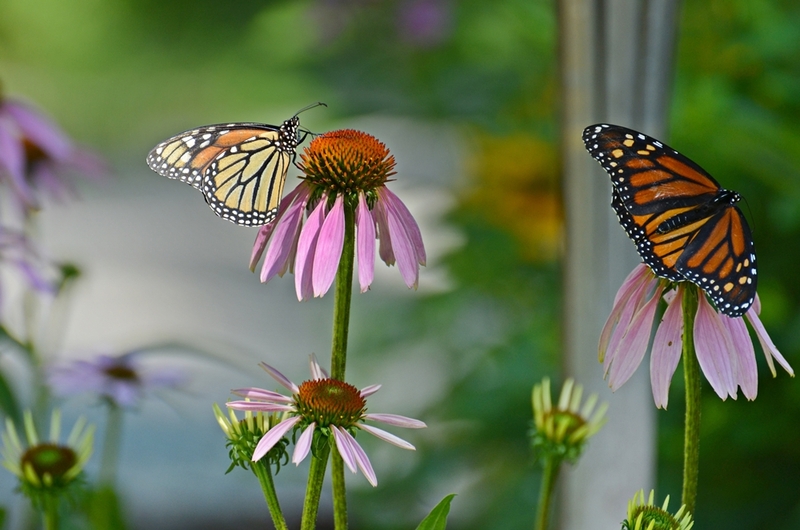 Even plant cultivars that no longer easily produce nectar and pollen minimize the availability of nectar-rich flowers needed to sustain adult butterflies. You can help by growing a milkweed species on your property, in particular common milkweed where possible. Note that common milkweed is considered toxic to livestock. 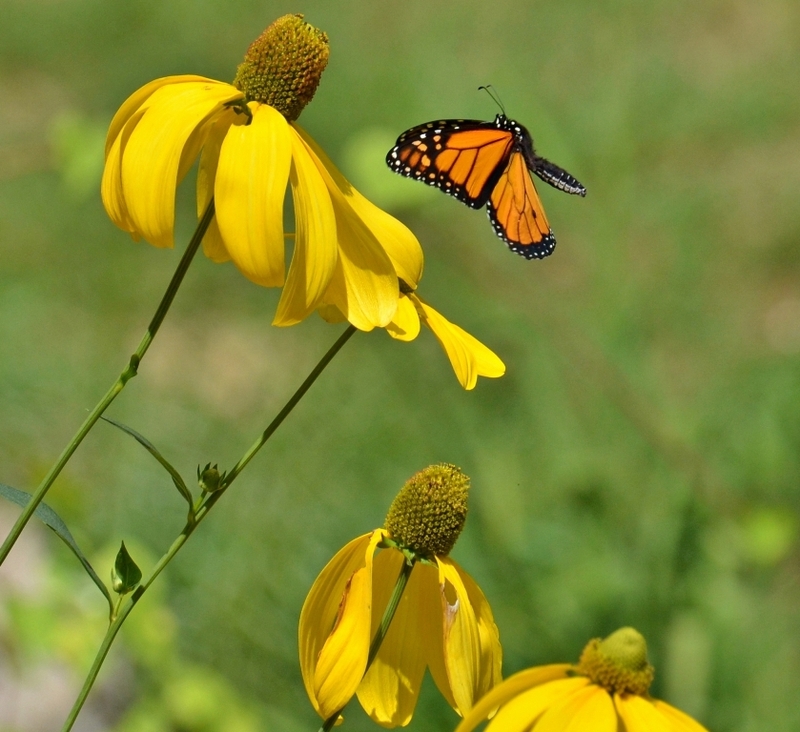 Some municipalities have the common milkweed on their noxious weed list, but growing awareness of the importance of milkweed may be shifting the public’s opinion away from its cosmetic implications. Notes: Special thanks to Jean Lauriault for his help with this species profile.